This below list of informal fallacies is from “The Don Lindsey Archive”. We have added extra at the bottom. We encourage you to browse this archive and learn how to spot fallacies in sermons and online articles and discussions. 28. Ambiguous Assertion a statement is made, but it is sufficiently unclear that it leaves some sort of leeway. 29. Argument By Fast Talking argument that relies on speed to go from one idea to the next so the audience won’t have time to think. 30. Failure to state if you make enough attacks, and ask enough questions, you may never have to actually define your own position on the topic. 31. Appeal To Complexity if the arguer doesn’t understand the topic, he concludes that nobody understands it. So, his opinions are as good as anybody’s. 32. Argument By Laziness (Argument By Uninformed Opinion) the arguer hasn’t bothered to learn anything about the topic. He nevertheless has an opinion, and will be insulted if his opinion is not treated with respect. 33. 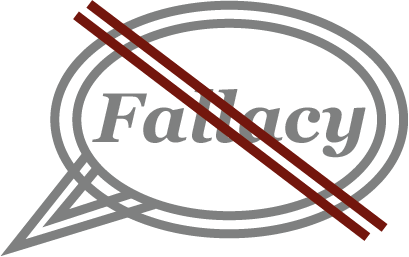 Disproof By Fallacy if a conclusion can be reached in an obviously fallacious way, then the conclusion is incorrectly declared wrong. 34. False Compromise if one does not understand a debate, it must be “fair” to split the difference, and agree on a compromise between the opinions. 35. Pious Fraud a fraud done to accomplish some good end, on the theory that the end justifies the means. 37. Antithesis backflip (Darkothesis) a technique where someone reads the scripture (thesis); insists what the scripture does not say (antithesis); but smuggles the error into the antithesis which in turn flips the meaning of the original scripture to say something it doesn’t. 38. Time Will Tell Fallacy (Appeal to time) if the arguer doesn’t want to deal with an issue, he concludes that only time can be the answer. This can be used to shut down valid conversation. 39. Deflection tactic (Appeal to relationship) Built on the assumption that an individual’s personal charisma and charm are more important than an evaluation of their teachings and actions, this fallacy deflects the criticism by deflecting the issues raised and asking if the arguer personally knows the individual in question. In Sydney Australia some years ago I heard one of the most vague sermons. The pastor read Genesis 28:20-22, then entitled his sermon “The wrong side of if” He sounded as if he was going around in circles and I prayed the pastor would be rescued from his sermon. Next day, Monday, I rang the church to ask what the sermon was about. I was told. Pray and ask God. That pastor has since left the church…and moved to USA… they’ll love him there I’m sure.